Irish water globe is a musical figurine that features the Claddagh along with shamrocks and Celtic Trinity knots; wind it to play When Irish Eyes are Smiling. 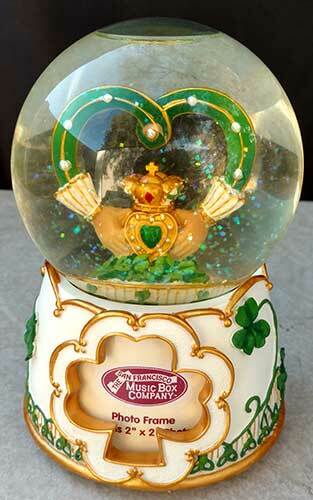 The shamrock on the base of this Irish snow globe holds your 2” x 2” photo! You just slide your photo in from the slot in the base. This Irish water globe features an open photo holding shamrock along with embossed shamrocks and Trinity knots on the dimensional base. 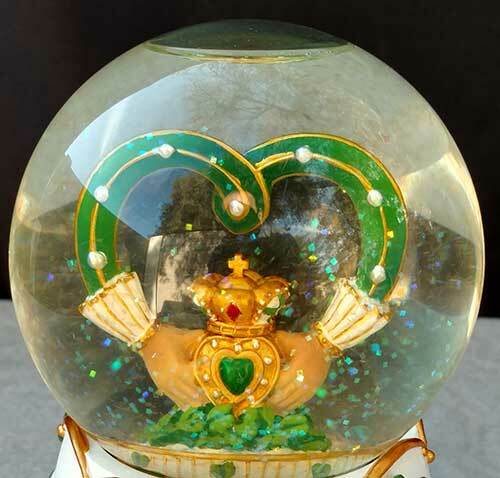 The inside features a jeweled Claddagh that is surrounded by a cluster of shamrocks. 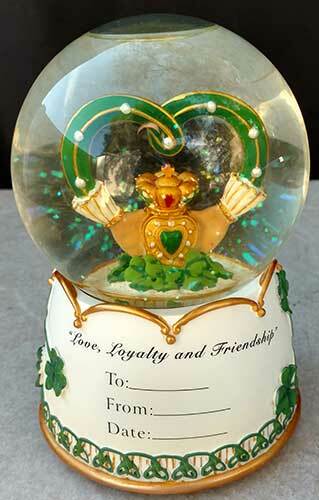 The Claddagh water globe is made of resin and glass; it measures 3 1/2" wide x 5 1/2" tall. The musical Irish water globe is made by The San Francisco Music Box Company; it is gift boxed with Claddagh, Celtic knot and shamrock history cards, complements of The Irish Gift House. Irish water globe is a musical figurine with green glass four leaf clovers; wind it to play When Irish Eyes are Smiling. 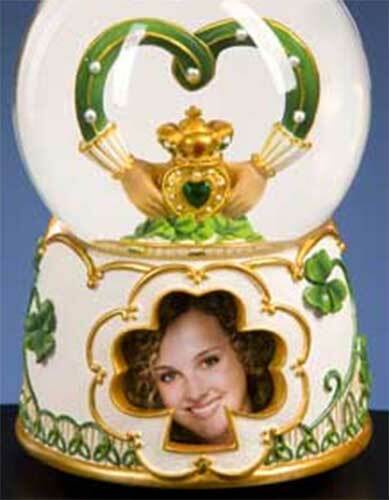 Irish water globe is a musical figurine, with a leprechaun and pot of gold, that plays When Irish Eyes are Smiling when wound up. Celtic cross is a standing musical design from The San Francisco Music Box Company. Irish water globe is a musical figurine that features shamrocks along with a Celtic cross and the Claddagh; wind it play The Lord's Prayer.